Here's a card I made for my workshop back in March and I've realized I haven't posted it yet. Tomorrow is the last day for Sale-a-bration benefits. 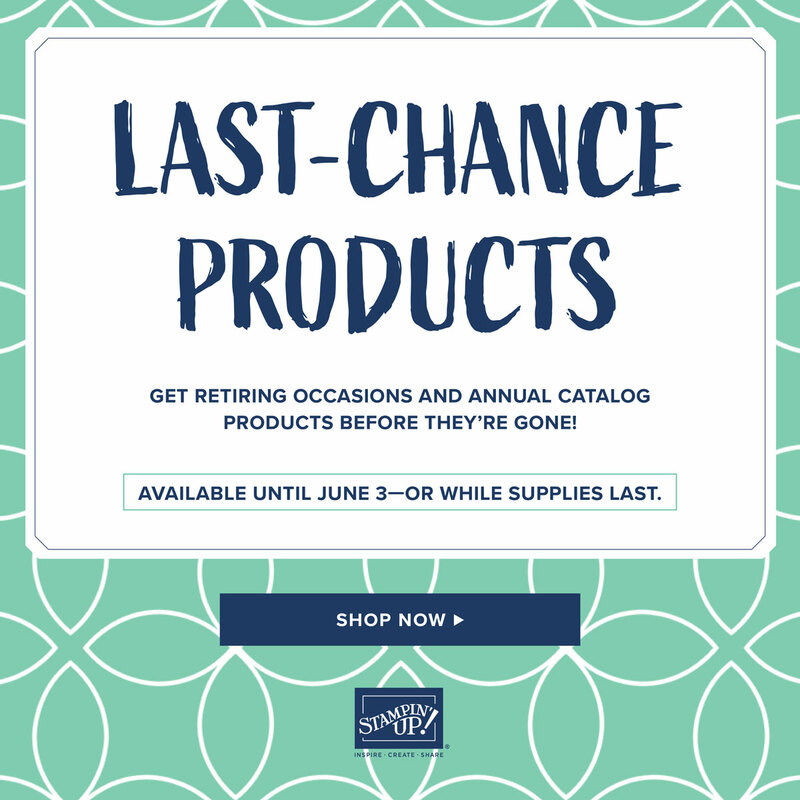 Spend $50 and earn free products. I made this card with two SAB stamp sets, the SAB Welcome Neighbor DSP pad and the SAB Scallop trim border punch. I colored in the flowers from Happy Moments with blender pens and Crushed Curry, Melon Mambo and Old Olive ink pads. The sentiment was stamped in Old Olive. The Mambo card stock was punched with the Scallop Trim border punch. A piece of Old Olive 5/8 inch Satin ribbon finishes it off. Finally finished with my Easter cards. I made this one for the Stamping 411 sketch #144 here. 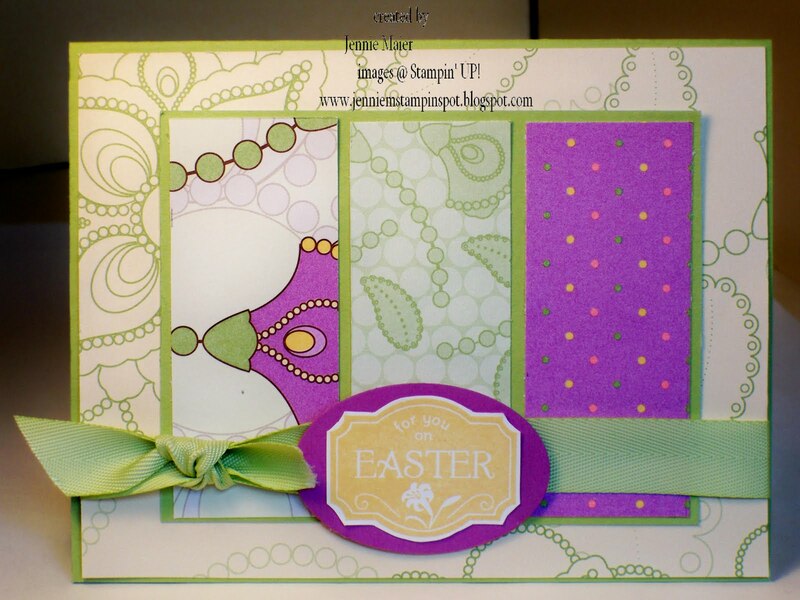 I used the Eggcoutrements and Teeny Tiny Wishes stamp sets with the Shades of Spring DSP. I started by running a piece of Pretty in Pink card stock thru the Big Shot with the Backgrounds 1 texturz plates. I also ran two pieces of So Saffron thru the Scallop Trim border punch. I stamped the bunny in Pretty in Pink ink and punched it out with the 1 inch circle punch then popped that up with a Stampin dimensional. Happy Easter was stamped in Pretty in Pink then punched out with the Word Window punch. I layered that on to a piece of So Saffron that I snipped out the ends. Finally, a Pretty in Pink designer flower brad finishes it off. This little thing is a gift card holder and it qualifies for the PPA#35 challenge-Anything But a Card. To make the holder I used a piece of Soft Suede card stock cut to 6 1/2 by 4 inches. I scored that at 2 1/4 and 5 1/4 and attached the bottom flap with eyelets so you can slide the gift card in the flap. Some velcro dots keep the flap closed. 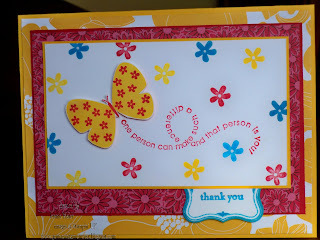 I used papers and the die cut from The Write Stuff Specialty DSP. The flowers from Little Flowers were stamped in Old Olive, Ruby Red and Soft Suede and punched out with the 1/2 inch circle punch. Best Wishes from Vintage Labels was stamped in Crushed Curry. A piece of 1/2 inch Old Olive striped grosgrain ribbon finishes it off. I hope you're not sick of my Easter cards yet! I still need a few more so here's one for this week's MojoMonday sketch#131 here. I'm just making more Easter cards and catching up on sketches. This one is for the Stamping 411 sketch#143 here. Here's my take on the Splitcoast sketch #272 here. I used some Sweet Pea DSP. I'll be sad when it retires on April 30th but I'll be using it a lot in the meantime! The only stamping was the sentiment from Whimsical Words that I stamped in Chocolate Chip. I punched that out with the 1 3/4 circle punch then layered it onto other circles cut with the Coluzzle. I used the Trio flower punch to punch the little flowers and added a circle of Old Olive to those centers. Finally, I used a little center of Old Olive from the Sweet Pea stitched felt. Just chipping away at my Easter cards and I used a Mojo sketch from a few weeks ago. It's Mojo sketch #128 here. There's not much stamping other than the Vintage Label and Happy Easter from Teeny Tiny Wishes. Then I punched that out with the Curly Label punch. I also ran a strip of Pretty in Pink thru the Scallop edge punch. The flower was cut out of a piece of Shades of Spring DSP. The Whisper White circle was stamped with Pretty in Pink ink with Dot, Dot, Dot. A So Saffron flower brad is in the middle of the big flower and two Circle Fire Rhinestone brads finish it off. I'm gonna miss the Happy Moments and Whimsical Words sets once they're gone the end of March! 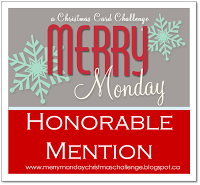 I used them for this card for the MojoMonday sketch #130 here. I stamped the cake in Basic Black then colored it in with Pumpkin Pie and Taken with Teal Stampin' write markers. I also used Taken with Teal ink and a blender pen. The sentiment was stamped in Pumpkin Pie. I added some dots with the White gel pen to the Taken with Teal piece that I ran thru the Scallop edge punch. Then I paper pierced some holes with the piercing tool. A piece of 1/2 inch Pumpkin Pie grosgrain ribbon finishes it off! This perky card was done for the PPA#34 sketch challenge here. I used some papers from the Sweet Pea DSP stack and the Eastern Blooms stamp set. I colored the flowers with So Saffron, Old Olive and Rose Red Stampin' write markers. 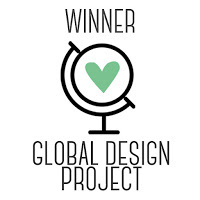 The sentiment is from Trendy Trees and was stamped in Old Olive. I ran the dotted paper thru the Scallop Edge punch. The 1/2 inch striped Old Olive ribbon finishes it off with a gold brad attached at each end. 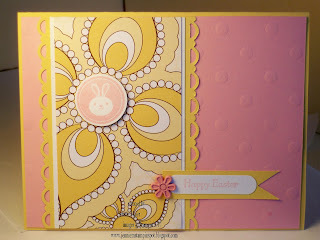 This Easter card is for the Stamping 411 sketch #142 here. I decided to to a mono-chromatic card using the DSP from Shades of Spring. I started by running the Certainly Celery card stock base thru the Big Shot with the flowers & dots Backgrounds 1 texturz plate. I rubbed that with some Very Vanilla Craft ink to make the images pop a bit. 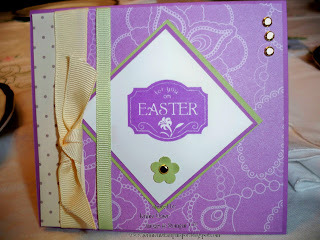 The only real stamping on this card is the Easter image from Eggcoutrements that I stamped in So Saffron. I punched a Celery flower from the Trio Flower punch and added a gold brad to the center. That whole image was popped up with some Stampin dimensionals. A piece of Very Vanilla taffeta ribbon finishes it off! This bright card was made for the Splitcoast Sketch #271 here. I used the Flight of the Butterfly stamp set. The flowers were stamped in Real Red, Summer Sun and Tempting Turquoise. The sentiment in Real Red and the butterfly was stamped in Summer Sun then the flowers added in Real Red. 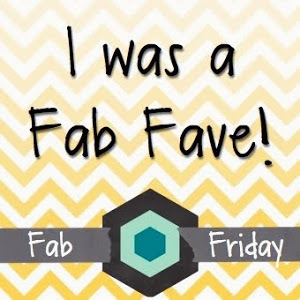 That was then popped up with some Stampin dimensionals. There's a Vintage Label in Turquoise and the thank you is from Teeny Tiny Wishes. The DSP is Pink Flamingo. Another Easter card checked off the list! It may be hard to see but I started this card by running a piece of Very Vanilla thru the Big Shot with the Perfect Details Texturz plate. I added some Shades of Spring DSP to the bottom. I used the Eggcoutrements stamp set to stamp the scallop in Orchid Opulence and the little chick in So Saffron. 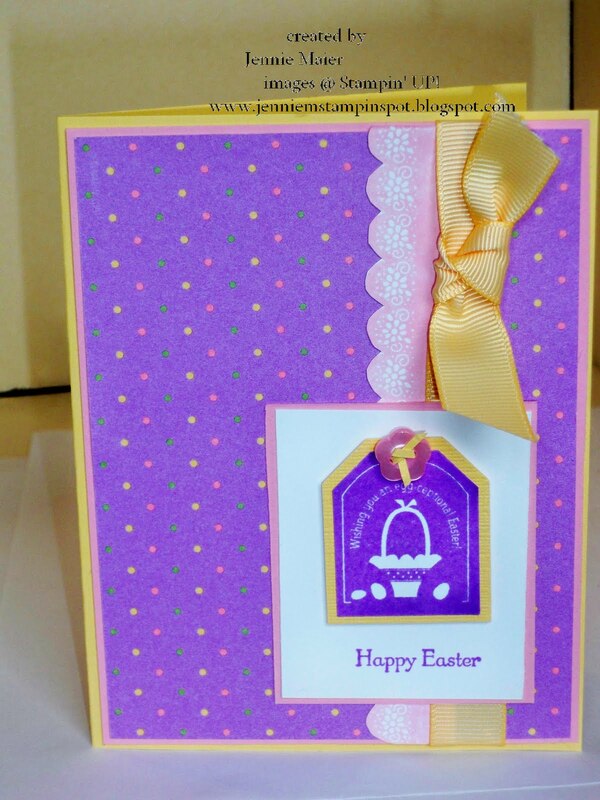 Happy Easter is from Teeny Tiny Wishes and that was stamped in Orchid Opulence then punched out with the Word Window punch and layered onto an Orchid piece punched with the Modern Label punch. An Orchid piece was punched with the Scallop square punch then a Celery piece was punched with the 1 1/4 inch square punch. A piece of 1/4 inch Celery grosgrain finishes it off. Just playing catch up again with the MojoMonday sketch #127 here. I gotta get these Easter cards done before we leave for Easter Break! It's only three weeks from yesterday and I can't wait! 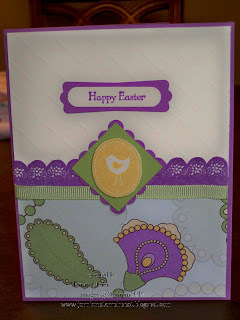 I used the Eggcoutrements stamps set on this one and inked the image up with Orchid Opluence. The papers are from the Shades of Spring DSP. I punched a Certainly Celery flower out with the Trio flower punch and added a gold brad for the center. Three gold brads were used in the upper corner too. 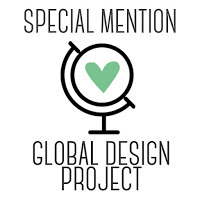 Some Very Vanilla and Certainly Celery grosgrain ribbon finish it off! This is a card I made for my recent workshop to demo the Vintage Labels SAB set. It was really fast and turned out really cute, if I do say so myself. I stamped the labels in Rose Red on the Rose Red card stock. I added a strip of striped paper from the Thoroughly Modern DSP. 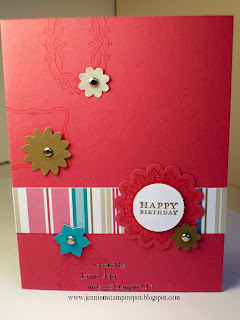 I stamped the scalloped label in Rose Red on Rose Red card stock then punched it out with the Scallop Circle punch. I stamped the Happy Bday in Soft Suede on Whisper White then punched that with the 1 inch circle punch and popped it up with Stampin Dimensionals. The flowers were punched with the Boho Blossoms punch in Bermuda Bay, Sahara Sand and Soft Suede then adhered with a silver brad. 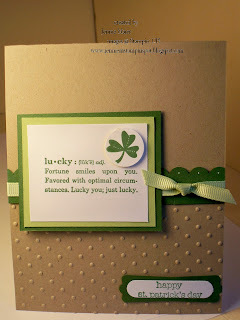 I made this St Patty's Day card for the PPA Challenge #33 here. It's a color challenge and the colors are Garden Green, Certainly Celery and Kraft. So St. Patrick's Day naturally came to my mind. I started by running the Kraft base thru the Big Shot with the Perfect Polka Dots impressions folder. I punched a strip of Garden Green with the Scallop Edge punch and added some White gel pen dots. I stamped the lucky image from Define Your Life in Garden Green and the shamrock image from Holiday Blitz in Garden Green too. I punched that out with the 1 inch circle punch and added a Stampin dimensional. The sentiment is from Teeny Tiny Wishes and that was stamped in Garden Green too then punched with the Word Window punch and layered onto a Garden Green piece punched with the Modern Label punch. Finally, a piece of Certainly Celery 1/4 inch grosgrain finishes it off! I'm getting to my Easter cards and finally catching up on some MojoMonday sketches. This one is from way back in February, MOJO126 here. I used the Shades of Spring DSP and the Eggcoutrements stamp set from the Occasions Mini. 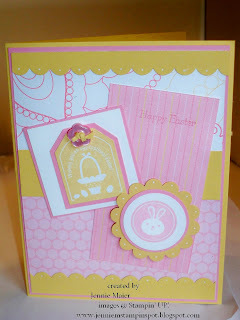 I stamped the tag image in So Saffron and the bunny image in Pretty in Pink. Then I punched the Saffron image with the Small tag punch and layered that on a piece of Pretty in Pink punched with the Large tag punch. The bunny image was punched with the 1 1/4 inch circle punch, layered onto a piece of Pretty in Pink punched with the 1 3/8 inch circle punch and finally onto a Saffron piece punched with the Scallop circle punch. The Saffron pieces were punched with the Scallop Edge punch too. Happy Easter from Teeny Tiny Wishes was stamped in Pretty in Pink. A Pretty in Pink Sherbet Designer button was added to the tags.Finally, some dots were added with the White gel pen. I'm on a roll, so here's another card I made today. It's for last week's card sketch, SC270 here at Splitcoast. 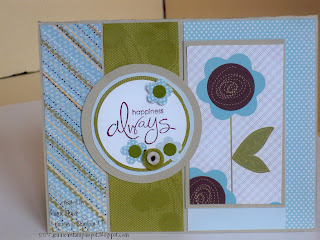 I had my SAB Welcome Neighbor DSP stack out for my last card so I just used up some scraps for this one. 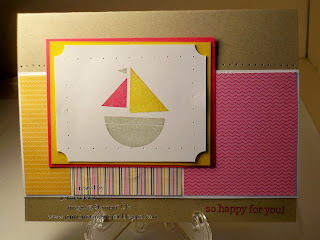 I stamped the sailboat from Nursery Necessities using the Crushed Curry, Melon Mambo and Sahara Sand Stampin write markers. Then I used the Ticket Corner punch on the piece of Whisper White card stock. I also did some paper piercing to add some texture. Finally, the sentiment was stamped in Melon Mambo. I'm savoring some "me time" today and playing in my basement studio. I made this card for the Stamping 411 sketch #141 here and for the Splitcoast Color Combo #261 here. The colors are Bashful Blue, Certainly Celery and Melon Mambo. I started with stamping the Dot, Dot, Dot stamp in Melon Mambo ink on Melon Mambo card stock. Then I punched that out with the XL Fancy Flower punch. 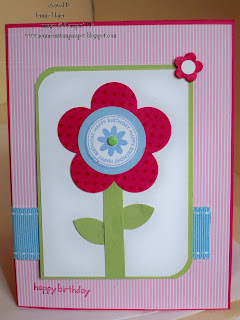 I stamped the Happy Birthday flower stamp from Wow Flowers in Bashful Blue and punched that out with the 1 inch circle punch. I layered a piece of Bashful Blue punched with the 1 1/4 inch circle punch and added a Celery brad. The stem was made from scraps of Certainly Celery and the flowers were punched and then cut with the 5-petal flower punch. A flower from the Trio flower punch was popped up with Stampin dimensionals and a piece of the 1 inch double-stitched Bashful Blue grosgrain ribbon finishes it off! 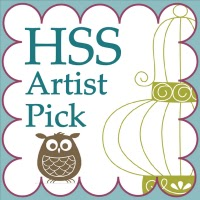 This spring card is for the Stamping 411 sketch #140 here. It was from last week but this is my week to catch up! I finally got my Beautiful Wings Embosslits die today so I had to play with it! The only stamped part of this card is the "get well wishes" from Teeny Tiny Wishes. The papers are from Shades of Spring DSP. Here are some samples from my workshop this week. I used the Shades of Spring DSP from the Mini so these would qualify for the PPA#32 challenge-Spring Theme. 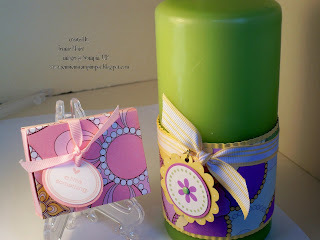 The box was made using the Stampin UP Matchbox Bigz XL die. It's too quick and too cute! I used Pretty in Pink card stock for the base and Shades of Spring DSP for the cover. I stamped the image from Matchbox Messages in Pretty in Pink , punched that with the 1 1/4 inch circle punch and layered that onto a 1 3/8 inch circle punched from Pretty in Pink. A piece of 1/4 inch Pretty in Pink grosgrain finished it off. Tucked inside are 4 Hershey's nuggets-yum! For the candle, I started by running a piece of So Saffron card stock thru the Crimper and layered a piece of Shades of Spring DSP over that. I used some Sticky Strip to adhere the pieces and ends together for a tight fit. I used the stamps from Think Happy Thoughts in both Certainly Celery and Orchid Opulence and punched that out with the 1 1/4 inch circle punch. A piece of Orchid was punched with the 1 3/8 inch circle punch and layered onto a So Saffron piece punched with the Scallop Circle punch. A Certainly Celery brad in the center and a piece of 1/2 inch So Saffron striped grosgrain ribbon finishes it off! This card is for the Splitcoast sketch #268 here and showcases the stamp set Four Square. You can earn this set FREE when you spend $50 on an order now thru March 31st. I used The Write Stuff Specialty papers. I first stamped the image in Ruby Red on Whisper White card stock and punched it out with the 1 1/4 inch square punch. 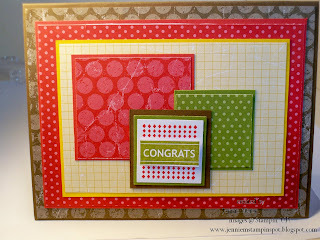 Then I inked up the "congrats" part in Old Olive, cut that out and added Stampin dimensionals. Quick and cute! I needed a birthday card for a tween boy and this one fits the bill. 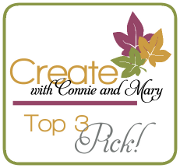 I'm also finishing up getting ready for tonight's workshop so this is will be a quick one! I hope to post some projects this week for sure. 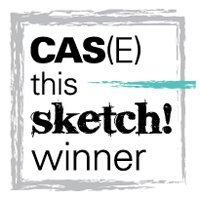 I made this for the Splitcoast sketch #267 here. 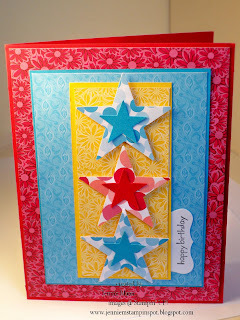 I used the papers from Pink Flamingo DSP, punched three large and small stars then adhered with Stampin dimensionals. The Happy Birthday is from the SAB set, Happy Moments and that was stamped in Basic Black then punched out with half of the Curly Label punch.